Thanks to Lenovo, I’ve been given an interesting new gadget to review – the Lenovo 500 Multimedia Controller. It’s a compact sized wireless keyboard, designed for usage from a couch. For a long time, I’ve used a computer plugged into the main loungeroom TV for a variety of things – watching TV shows and movies via local copies of content on Kodi, streaming services like Netflix and YouTube, as well as general web browsing. A standard wireless keyboard and mouse, an ‘air mouse’ – too clunky and no nice flat surface to use the mouse on. An ‘air mouse’ which is what happens when you breed a keyboard and Nintendo Wiimote together – inaccurate and slow to type on. A dedicated remote control for ‘media’ content – too limiting in what you can do with it, no keyboard for typing. Smartphone as keyboard/mouse – keyboard too slow to type on, mouse too tricky to use, always need smartphone around. The all in one keyboard and trackpad gives me what I want – a full keyboard experience so I can type fast, a multi-touch trackpad so I can move the cursor around fairly well, and use gestures like scrolling through pages. However, it’s still rather large, and doesn’t really like being dropped (the batteries generally go flying). That’s why I was looking forward to trying Lenovo’s solution to this, and compare it to my currently winning solution. Opening the box, all that’s inside beyond plastic and manuals are the keyboard itself, a tiny dongle, and a USB extension cable. Getting the back cover off was a bit tricky – I needed to apply a lot more force than I was comfortable with, but that’s probably good for a device that’ll probably get thrown around and dropped. It takes two AAA batteries (included in the box in some countries) which will last up to 8 months – about normal for a wireless keyboard. After plugging it in to my Intel NUC running Windows 10, the device was ready to use. When I first looked at the device (I decided to approach it with no research until after I’d finished playing), I assumed the bottom section was a trackpad. It turns out, the entire keyboard area is a trackpad! Everywhere from the top left Escape key, to the bottom right arrow key is one giant trackpad – despite the keys actually being individual buttons that press down. It even supports gestures, such as scrolling. The bottom section are dedicated left and right click mouse buttons, with no touch abilities. The keyboard itself can be used to click also, just like a trackpad and using a tap motion rather than actually pressing down on it. It’s also worth noting that the cursor sensitivity can be adjusted via the keyboard itself, with the Fn + F9 and Fn+F10 key combos – personally I upped the sensitivity a bit. Keyboard keys – they press down seperately and actually click. Typing can be done similar to the old full keyboard Nokias. Touchpad sensitivity – because the keys are so close to the edge, I found my hands would accidently rest againt a key and affect my ability to move the cursor. Overall, this is the best keyboard I’ve seen for couch usage for it’s size. The more important consideration is how you expect to use it; if you do a lot of typing and are used to typing fast, you’re going to need a full sized keyboard – no mini keyboard is going to be as good to use. However, for light typing and a trackpad experience, in a form factor that’s around smart-phone size, this ticks all the boxes. Because the Lenovo 500 Multimedia Controller is a different style of device than what you’d be used to, there is a little adaptation required to put your hands in the right spot, get used to tapping the trackpad instead of clicking and use a small keyboard – but these to me were just minor adjustments I had to learn, rather than being too difficult to change what I do. A note for Australians – at the time of writing, I can’t see anywhere to buy this locally, but for US residents the device costs around $40US. Almost two years ago, I wrote about my Media Player Quest. The end result hardware wise was an Intel NUC, which has been dutifully serving me media content and left on 24/7 for over two years. It’s time to upgrade that now, and check out Intel’s newer lineup of NUCs that have the 6th generation Intel CPU inside. 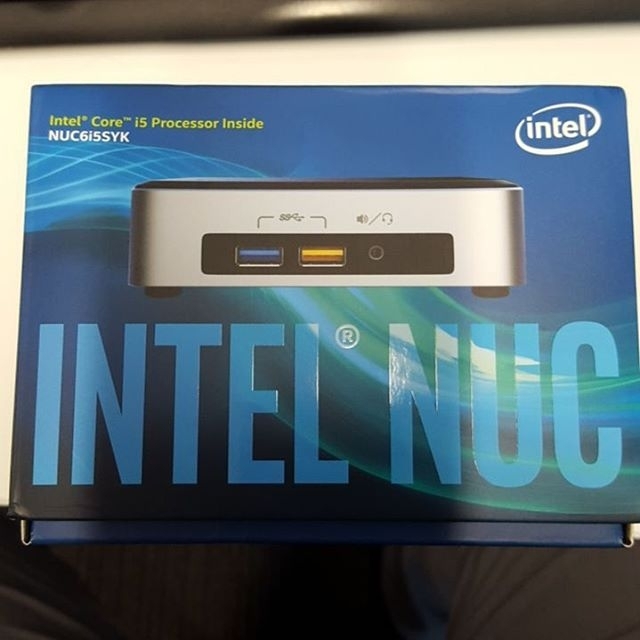 The unit I received was the NUC6I5SYK – there’s also the NUC6I3SYK which is identical apart from having an i3 CPU rather than the i5 I received (a big step up from the Celeron in my old unit!). There’s a bunch of different NUCs both old and new, but in the latest batch there are 5 to choose from. 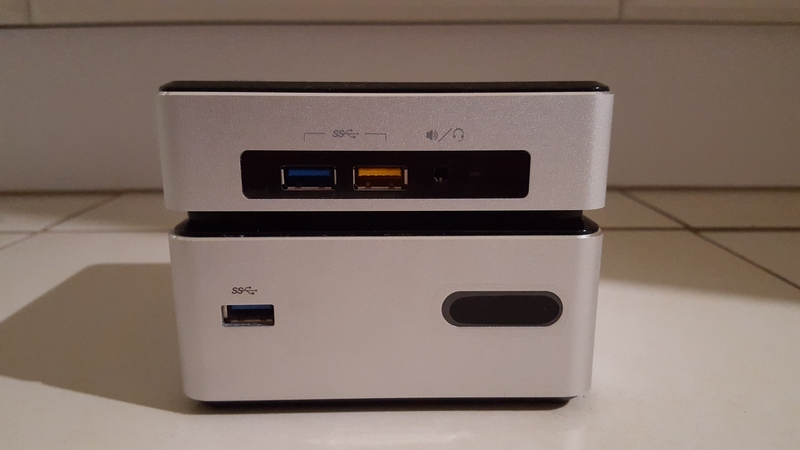 The cheaper ‘Pentium’ powered NUC NUC5PGYH, the NUC6i3SYH and NUC6I5SYH which are i3 and i5 powered NUCs with 2.5″ drive support, and the two I mentioned above, which are identical but don’t have 2.5″ drive support. All other specs are the same. At this point you may be wondering which is best or which one to choose. Luckily this is pretty clear cut – if you don’t need much grunt, go for the NUC5PGYH. This still takes a 2.5″ drive, so you may be able to find a cheap small SSD to use. Otherwise, i3 and i5 are both pretty good, you’ll only need an i5 if you want to use it like a proper PC and play games or edit photos and videos, or other CPU intensive tasks. Finally, the SSD – go 2.5″ if you already have one to save money, or don’t care about the extra height. 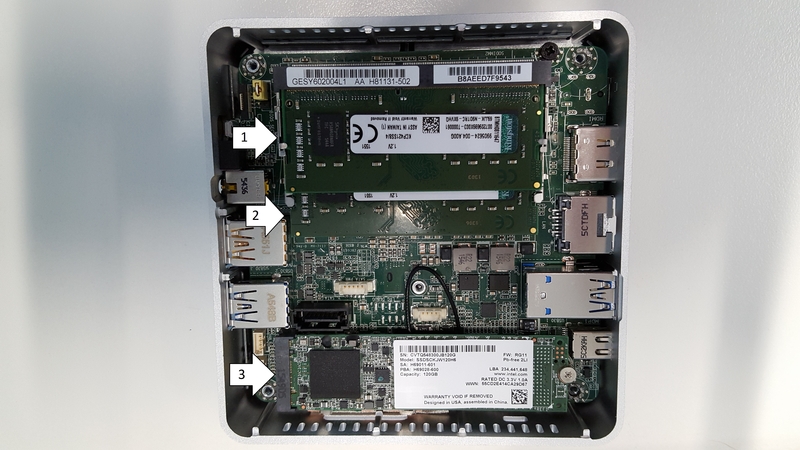 The M.2 version is a lot sleeker, but there should only be a small difference in SSD performance, which you probably won’t notice based on the common use cases for a NUC. If you’re hiding it behind a monitor, it’ll be easier to fit the M.2 version next to a wall. My unit isn’t as tall as the 2.5″ models, because instead it takes a M.2 SSD instead. They look similar to RAM, but have the slot on the short side, rather than on the long side (see below). Don’t get these confused with mSATA – M.2 is the next generation of those and they have different connections. There’s a lot more technical information about this, if you’re interested check this guide out. 1 & 2 are DDR4 SODIMM RAM sticks. 2 x 2GB in this one but they’ll take a maximum of 2 x 16GB = 32GB – more than enough! 3 is the M.2 SSD, mine of which (as you can see from the label) has a capacity of 120GB. I’m not storing too much locally – apart from Windows 10 and a few software installs, the media I’ll be playing is streamed either from the internet (care of services like Netflix) or via local network (care of Kodi). Once those are added (and they’re incredibly easy to obtain from any PC parts supplier) the NUC is ready to go – at least, ready to have your OS of choice installed on it. 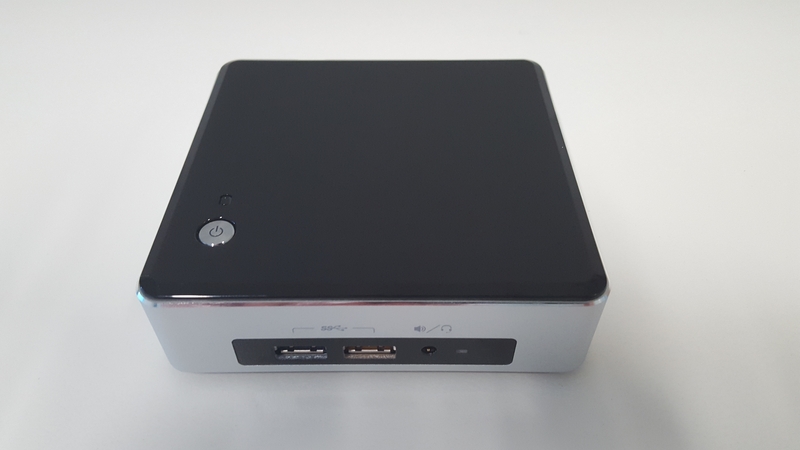 Port wise, the Intel NUC has more than enough for it’s small 115mm x 111mm x 32mm size. Once I had the new NUC up and running, I did notice a smoother experience. The old one wasn’t actually slow for general Windows 10 usage, but things felt snappier and more responsive with the much updated hardware. Overall I can’t fault this unit. I loved the last one, and this just gives a refresh with newer hardware and more connection types. What isn’t there to like about this? VESA mounts are included too, which will turn a screen into an all in one PC with ease. Other Mini PCs exist, but Intel support their own hardware well and let you decide on your own RAM and storage requirements, rather than bundling the lot. Intel know this makes a great Media Box and have created some Intel only apps, such as the “Intel® Remote Keyboard” which lets you use your phone as a keyboard and mouse which I’ll cover seperately soon. Any questions about the NUCs? Comment below! 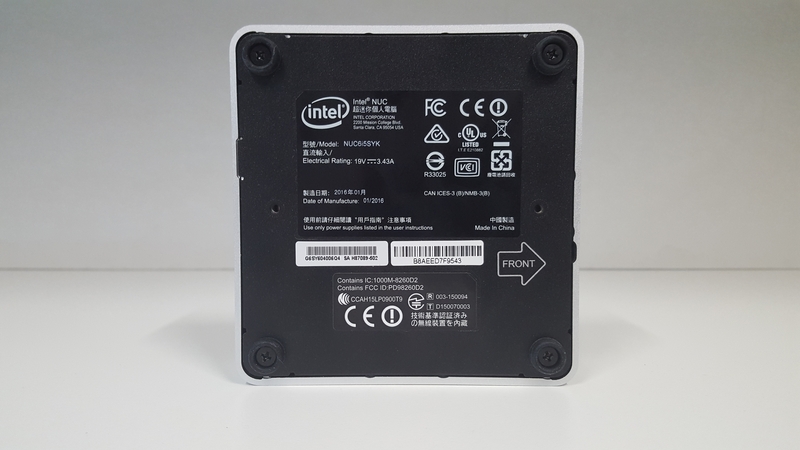 The Intel NUC covered in this post was provided by Intel Australia.